You’ve told us that using technology in your teaching is important so we spent some time evaluating various platforms and software that help negotiation teachers and trainers to utilize the power of role-plays in their classes. 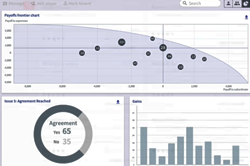 The team at iDecisionGames has created a web-based platform that offers many benefits and opportunities to transform how you teach with negotiation role-plays. The Teaching Negotiation Resource Center is excited to announce that you can now teach our catalog of great negotiation exercises in an entirely fresh way! Teachers and trainers can leverage the power of technology to enhance their negotiation classes by using TNRC role-plays on the iDecisionGames (iDG) platform. iDecisionGames has created a simple template for each exercise including outcome forms and charts so educators can be up and running with a few clicks. iDG has made it easy to run exercises, gather debrief information and display graphs. Teaching in the digital space is an important but difficult step for some educators to take. Many of you have expressed interest, but not necessarily confidence, in leveraging technology in your classroom. Efficiency is important, but so is the quality of the student/teacher experience, customer support and cost. Program on Negotiation Faculty and Executive Committee member Jared Curhan (MIT Sloan Distinguished Professor of Management) was similarly unsure about how smooth the transition would be prior to his first pilot of the iDG platform. Curhan, a detail-oriented educator already familiar with the power of technology in negotiation teaching, decided to heavily customize the TNRC negotiation exercises he planned to use. According to Curhan “…I’ve spent considerable time with the iDecisionGames team to ensure each role-play I intend to use is exactly how I need it to be. The platform is incredibly customizable”. Curhan offered a helpful nugget of advice to interested colleagues who might feel unsure about enhancing their negotiation exercises with technology. “Let your students know you’re trying something out for the first time. In my experience, they are not only tolerant, but also quite enthusiastic to engage with something new”. Curhan has built on his early successes and now intends to run all of his negotiation role-play scenarios on the iDecisionGames platform: from his semester length courses at MIT, to his Executive Education teaching, to his online programs. When asked if the effort to learn a new technology was worth the payoff in the classroom, Curhan replied: “Yes! Hopefully the investment of time and energy we spent customizing our role-plays can benefit other users of the platform”. iDecisionGames Founder Niraj Kumar agrees that every educator who runs negotiation exercises on their platform “benefits from the experience of other teachers and trainers who use the platform”. According to Niraj, the iDG team “has incorporated a wealth of experience including input from various professors from 14 of the top 20 business schools, who now use the iDG platform”. Customizing the outcome form and adding pre/post negotiation survey questions is very easy to do. Building further customizations with specific visualizations is a great way to tailor the experience your students will have in your class. The iDecisionGames team is happy to work with TNRC customers on those additional customizations just as they did with Jared Curhan. If you’re interested in trying out the iDecisionGames platform or just want to find out more about the process, please contact iDecisionGames directly by visiting iDecisionGames.com, or take a look at their explainer video. You can email the iDG team at info@idecisiongames.com. iDecisionGames is a licensed distributor of TNRC role-plays and negotiation exercises so if you decide to use our material on their platform, you can buy your TNRC materials directly from iDecisionGames. Curious how iDecisionGames was born? Niraj attended leadership training for Vice Presidents at his former employer Goldman Sachs. During his course he realized just how much value could be added to negotiation teaching with some smart technological enhancements. iDecisionGames was created shortly thereafter. TNRC negotiation exercises are designed for educational purposes. They are used in college classroom settings or corporate training settings; used by mediators and facilitators seeking to introduce their clients to a process or issue; and used by individuals who want to enhance their negotiation skills and knowledge.